Charlie Avis (CA): Good morning Mostafa and greetings from Geneva. Thank you for answering my questions which aim to shed light on the work you are doing to support the sound management of chemicals and waste across the Arabic-speaking countries. Mostafa Kamel (MK): Thank you, Charlie, we are delighted to be featured. CA: Firstly, please tell us a little bit about the Regional Centre (RC) itself. Where are you housed, how many staff do you have, and when was the RC established: basically how did the RC come about? 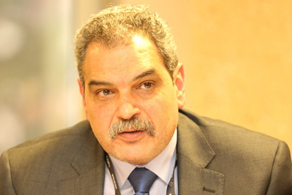 MK: Of course I would like first to introduce myself; my name is Prof. Moustafa Hussein Kamel, the Director of BCRC-Egypt. Beside being BCRC-Egypt Director, I am a Professor at the Faculty of Science, Cairo University, in Egypt. Regarding BCRC-Egypt, BCRC-Egypt is a regional centre that facilitates the implementation of the multilateral Environmental agreements in 22 Arab states in North Africa and West Asia. The conference of parties of the Basel convention adopted decision VI/9 to establish BCRC-Egypt in Egypt. The Government of Egypt has signed the framework agreement with the Secretariat of the Basel Convention for the legal establishment of the centre, and it is now hosted within one of the most outstanding academic and research institutes in the region; the Cairo University, since 2004. BCRC-Egypt has a unique issue than all the regional centres around the world, that it serves countries in two continents, Asia and Africa. This adds richness to the knowledge and experience which may be generated from interacting with the 22 Arab states. Following the ratification of the Framework Agreement by the Egyptian Parliament in 2005, BCRC-Egypt had its own structure and bank account with flexibility to assign part-time consultants and administrative staff for implementing projects and other capacity building activities. The BCRC-Egypt structure includes a Steering Committee of the Centre (CSC) with membership of the representatives of four rotating member countries (currently Saudi Arabia, Sudan, Bahrain and Djibouti), the host country, Egypt, the representative of the Secretariat of the Basel Convention, The representative of the Arab League, President Cairo University (Observer), Vice President for Environmental Affairs, Cairo University (Observer) and the Director of BCRC-Egypt. CA: Now, and at the risk of generalisation, what are the main constraints or challenges to protecting health and environment in the region from the harmful effects of toxic chemicals and waste? MK: Charlie, The Chemicals and waste issue has become a very hot topic around the world for its environmental, economic and health impact of course. Currently, there is a great global need to address that issue and try to find a solution for it, especially with the less developing countries. Of course, I am aware that the international bodies such as the UN, the UNDP, the UNEP and Multilateral Environmental agreements Secretariat has been exerting great efforts to assist all the countries, especially the less developing ones in achieving the sound management of chemicals and waste. However, I still believe there is a role, which the regional centres like BCRC-Egypt, should play in order to enhance those efforts and maximize the benefit of the less developing countries from them. Serving 22 Arab states makes their needs and conditions vary according to their political, economic, environmental and developmental circumstances. This huge variations make the achieving the sustainable development more difficult, which requires more efforts from all the stakeholders, beside BCRC-Egypt of course. CA: Of these, which would you say is the main priority theme, or core business, for the Centre? Planning, designing, and managing HW disposal/recycling facilities. Analytical HW identification and classification. CA: Marine litter is gaining ever-greater visibility as a global and regional problem, and was the subject of significant attention at the recent U.N. Environment Assembly last month in Nairobi. Your region shares several vitally important marine environments. How is the Centre responding to these challenges, and do you see hopes for progress? MK: BCRC-Egypt has always been working on updating its mandate according to the Arab states needs and the new environmental updates that come on the surface through the concerned international organizations Caring about the marine sector is one of the sustainable development goals which was adopted by the UN in 2015. Still, even before that, it has been an important issue for all the Arab states that have important marine environments. Therefore, BCRC-Egypt has been encouraging the Arab states before and after 2015 on taking the most feasible measures to protect its marine environments according to the international standards. We always receive very promising cooperative responses from the Arab states. MK: BCRC-Egypt through the past few years focused its efforts on strengthening the regional cooperation of Arab states in hazardous waste management and trans-boundary control which should support compliance with the Basel Convention in the Arab states, inspite of the political instability facing few States in the region. Accordingly, through the past five years, BCRC-Egypt conducted a total of 28 activities, 19 workshops (18 Regional and 1 National in Egypt), 9 Trainings (7 Regional (2 “Hands On” trainings in Nigeria and Finland) and 2 National in Tunisia and Lebanon). All the activities focused on the capacity building, knowledge sharing and technology transfer among the Arab States. Also, BCRC-Egypt signed 3 MoUs with Regional Centres of Basel and Stockholm convention in China, India and Indonesia, in order to enhance collaboration and synergy between the regional centres of the Multilateral Environmental Agreements (MEAS).BCRC-Egypt initiated cooperation with national, regional and international NGOs, out of its faith of the common responsibility of all stake holders for how our environment could be better. Finally, BCRC-Egypt has completed, with the help of international professional experts, a draft for e-waste legislation, as guidance for the Arab states in e-waste management. BCRC-Egypt aims to translate the legislation into English language, to allow discussions with Parties worldwide. CA: Our readers might like to know you have active communications platforms such as the Centre’s facebook and twitter accounts. How important is social media for explaining your work to a wider audience? MK: BCRC-Egypt managed to maintain and update its website to include all the news, activities and structure of BCRC-Egypt and all the international entities that are related to BCRC-Egypt areas of interest (bcrc-egypt.com). The website provides users with all the multilateral environmental agreements (Basel, Stockholm and Rotterdam) documents and guidelines. Also the website can provide its users with information related to other relevant conventions and issues, such as Minamata Convention, the SAICM and the Sustainable Development Goals (SDGs) which were adopted by the UN in 2015 to achieve the 2030 Agenda. Also BCRC-Egypt continued its communication with the Arab members through social media, such as Facebook (www.facebook.com/BCRCEgypt.OfficialPage), twitter (www. twitter.com/bcrcegypt) and YouTube (www.youtube.com/user/bcrcegypt). On the other side, the media and the press (local and regional) have followed BCRC-Egypt activities due to the importance of the topics addressed in those activities on environment. Finally, BCRC-Egypt issued many non-periodic newsletters in Arabic language which summarized some of its activities. CA: Thank you, for your time and for your answers, and for sharing your insights.